This article submitted by Linda Stelling on 9/29/98. Two projects in the North Fork Crow River Watershed District (NFCRWD) will have an impact on the environment. 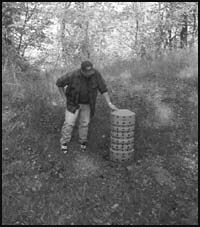 The staff at the North Fork Crow River Watershed District helped the landowners plan their projects and direct them to the proper environmental agencies. The property owner shares the cost of the project with the Minnesota Pollution Control Agency. Funds are also available through the watershed district, Clean Water Partnership Fund and federal funds. For more information on how to correct erosion problems, contact the NFCRWD, 320-346-2869. High water levels, fast moving river currents and cattle walking through the river took their toll on a section of the North Fork Crow River east of the Lake Street bridge. Gerald Kennedy and his family have owned the property a little over three years. In that time, he has seen the water levels of the river fluctuate and trees lose ground to the power of the river. “If a person is going to have property with a river running through it, you want it to look good,” Kennedy said. Two years ago, the city of Paynesville did a little work on the north side of the river to preserve their sanitary sewer pipes that run through the property to the city lagoon about one-half mile away. Kennedy had been in contact with the Department of Natural Resources and Stearns County Natural Resource Con-servation Service to learn more about his options. “The river banks were extremely eroded and the river was getting wider and wider,” he said. “The river bank was extremely eroded with three to four foot deep cuts in the shore. The river is on a bend at this point and the fast current during high water times took its toll on the shoreline.” Kennedy added he is a person concerned about pollution and was concerned about the future of the river. 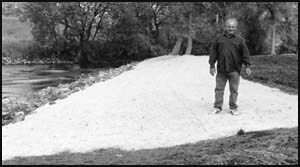 Gabrielson reshaped the river bank and built a bream on the south side. He also hauled in about 200 cubic yards of rip rap (rocks) ranging from eight inches in diameter to 36 inches in diameter. “This project is a test run in bio-engineering,” Gabrielson said. “About a 100 feet of the river is part of the bio-engineering. However, we worked at restoring about 500 feet of the river bank along Kennedy’s property.” Gabrielson said he still has to plant willow spikes along the river bank to promote new growth and to position willow logs in another area to stabilize the bank. The willow logs will also promote new growth. “I like the area and want to see it preserved for the future,” Kennedy said. Two property owners, Bob Burris and Don Theis, on the southeast shore of Rice Lake, joined forces to correct a highly eroded hillside. After years of neglect, a large gully had developed on the hillside between the two property owners. The gully measured about 12 to 15 feet deep, 50 feet wide and was about 100 feet long. Roger Hemphill, water quality technician with the North Fork Crow River Watershed District, said they smoothed out and filled in the gully. Two drainage risers and a series of sediment basins were installed to help move the surface water from the top of the hillside to the lake without eroding the hillside. The water passes through pipes at each level with the outlet at the base of the hill about 20 feet from the edge of Rice Lake.